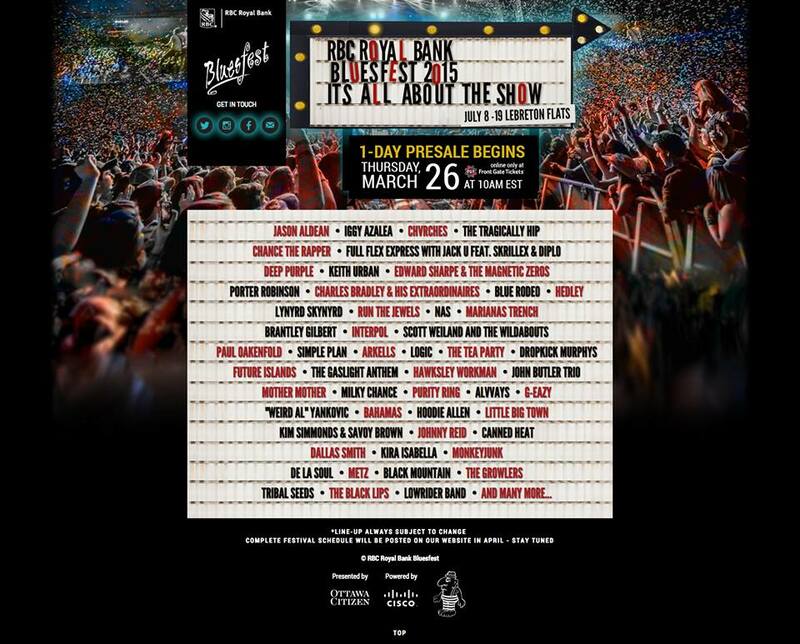 Ottawa Bluesfest has revealed its 2015 lineup. The Canadian mega fest takes place July 8th – 19th at Lebreton Flats in Ottawa, Ontario, Canada. The lineup includes Nas, CHVRCHES, “Weird Al” Yankovic, Interpol, Run the Jewels, Chance the Rapper, Future Islands, Purity Ring, the Full Flex Express featuring Skrillex and Diplo, METZ, The Black Lips, Alvvays, and Black Mountain. Deep Purple, Scott Weiland and the Wildabouts, Lynyrd Skynyrd, Iggy Azalea, The Tragically Hip, Edward Sharpe and the Magnetic Zeros, The Gaslight Anthem, Dropkick Murphys, Charles Bradley and His Extraordinaires, John Butler Trio, Milky Chance, Bahamas, The Growlers, Keith Urban, Jason Aldean, Porter Robinson, and Paul Oakenfold. A ticket pre-sale begins Thursday, March 26th. Visit the festival’s website for more details.